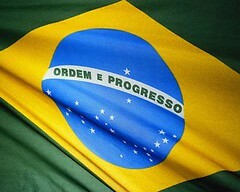 The Central Bank of Brazil has reported that the national budget surplus rose to BRL16.19 billion (approx. USD 8.8 billion) in January, a marked improvement over the previous month, and over the same period in 2009. Signaling an economic recovery for the country, the Brazilian Government has announced that it has experienced the second highest budget surplus ever recorded in the month of January for the country. The surplus, which included revenues from the federal government, local governments and state enterprises, had increased to BRL16.19 billion (approx. USD 8.8 billion), compared to BRL7.36 billion (approx. USD 4.05 billion) indicated in January 2009, and compare to BRL276 million (approx. USD152 million) in December 2009. The result has exceed most economic projections, which had estimated a surplus of no more than BRL14 billion (approx. USD7.69 billion). The raised national budget figure has been attributed to vast improvements in the country’s economic performance, and subsequent tax collections, along with the expiry of several industry-specific tax breaks. Further, the high surplus figure could be explained by the Brazilian Government’s customary propensity to reserve a significant portion of its spending for the latter half of the year.